The SpaceX Falcon 9 rocket successfully blasted off from Florida's Cape Canaveral Air Force Station Sunday night, marking a new chapter in America's space program. The rocket, carrying the SpaceX Dragon spacecraft, lifted off on Sunday nught (US time), heading for a rendezvous with the International Space Station. The craft is slated to arrive at the space station on Wednesday to deliver some ,000 pounds of cargo to the astronauts housed there. In May, SpaceX successfully completed a demo cargo flight to the space station. Sunday night's launch marked the company's first official resupply mission as part of a four-year, $1.6 billion contract to launch a dozen operational missions to the station. "This was a critical event in spaceflight tonight," said NASA Administrator Charles Bolden in a statement made soon after the launch. "We're once again launching spacecraft from American soil with the supplies our astronauts need in space. NASA and the nation are embarking on an ambitious program of space exploration." 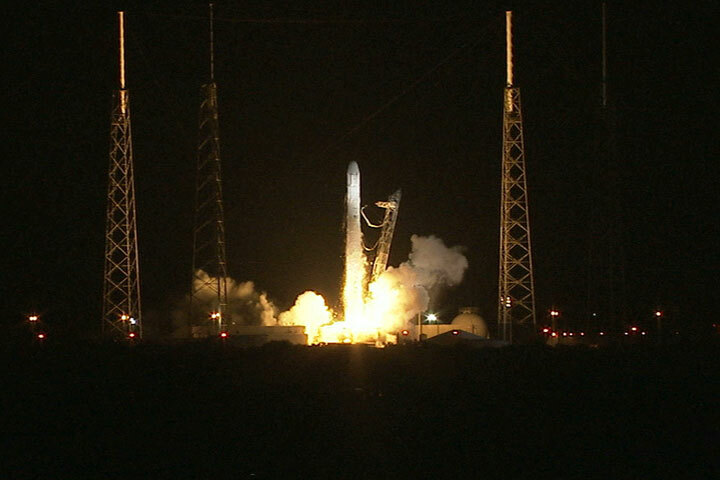 About 15 minutes after last night's launch, Dragon reached its planned orbit of 212 miles above Earth, according to NASA. It also opened two solar arrays on the side of the spacecraft to use sunlight to power the capsule's systems. When the craft reaches the space station, Suni Williams, an astronaut and space station commander, will use the Dragon's robotic arm to link to a space station port where astronauts can unload the cargo. Once the new equipment is loaded, the the astronauts will load the craft with nearly 2,000 pounds of used equipment and experiments. Dragon is slated to return to Earth in about three weeks. NASA retired its space shuttle fleet in the summer of 2011, so it now depends on companies like SpaceX to ferry astronauts and cargo to and from the space station. Meanwhile, NASA's engineers are focused on building high-powered engines and robotics, as well as preparing for more ambitious missions to the moon, asteroids or Mars.